This extension makes the IF, ELSE, ELSEIF, WHILE and other blocks collapsible in Visual Basic .NET and C#. Deprecated as the Visual Studio 2017 has implemented the functionality. This extension will no longer be maintained. 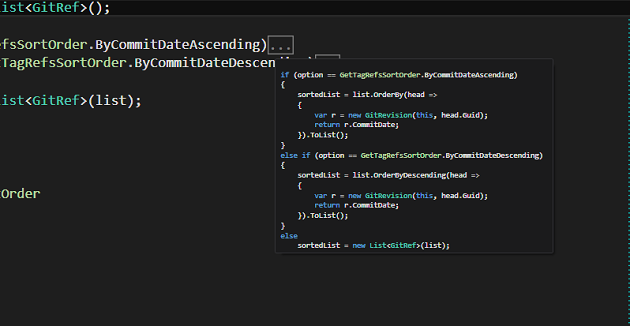 This extension provides additional outlining with syntax highlighted hint for Visual Basic .NET and C#; therefore we can collapse the blocks/scopes such as IF, ELSE, USING, WITH, WHILE and FOREACH. As you can see from the below image, there are couple of additional outliners added to the editor, so we can collapse them. Stop supporting Visual Studio 2017 because Visual Studio 2017 already has this functionality. If you feel that the work we provide is worth it, you can donate. This is greatly appreciated. You can use Paypal to donate even if you do not have a Paypal account.There is, of course, no obligation whatsoever.